In all the excitement over starting your affiliate marketing business, beginners often underestimate the importance of sending targeted website traffic to their merchants’ sites. Strange, given that generating targeted website traffic is really your main job as an affiliate and the only way you will make money as an online entrepreneur on a consistent basis. The merchant has really done all the heavy lifting if you think about it: created the products, set up a back office of marketing support tools, and offered you attractive commissions. Now it’s up to you to find your audience and convert enough of it into paying customers. At this point, you’re likely wondering what the steps are for getting people to notice you and click your affiliate links, and if you can really do it. Fortunately, regardless of your background, the formula for successful traffic generation works, and we lay out the first part below. Side Note: New to affiliate marketing and not sure what it is? Put simply affiliate marketing is an easy way to make money promoting other people's products. Learn more about launching an affiliate marketing business here. You must identify your target audience. Otherwise, you’ll be wasting time and energy driving the wrong types of people (traffic) to the wrong types of products, and your affiliate sales figures will suffer accordingly. What are their physical and emotional characteristics? What “language” do they use, i.e. are they more intellectual (analytical) or casual (informal) in nature? What do they like talking about, and who do they admire? Are the product brands and personalities that they identify closely with? The better you can answer these questions and really have an understanding of who your market is and what they want, the better chance you'll have at matching them up with products and services they'll be interested in purchasing. Haven't yet decided what market you want to target? This article on how to pick a profitable niche for your online business can help. Even the smallest of niches will have some competition, so it’s up to you to offer people compelling reasons to devote time to what you have to say. What distinguishes you from the hundreds (thousands?) of other affiliates offering essentially the same merchandise? Perhaps it’s your style of delivery that appeals to others. Many affiliates build an enviable reputation by being conversational and empathetic with their audience in a way that earns trust and likeability. For others, a more information and knowledge-based approach may be more appropriate. This type of strategy works in Health and Fitness, Nutrition, Sports, and various science-based niches. More often than not, though, a combination of social and intellectual interaction with the audience gets your foot in the door. One of the best ways to do this is by starting your own blog as a place for you to provide valuable content and promote affiliate offers. Another powerful marketing strategy is to focus on building your email list. Building your email list allows you to follow up with the people who visit your website or blog so you can build a relationship with them - get them to "know, like, and trust" you. It also allows you to follow up and promote multiple products that are relevant to your target market; significantly increasing your profits per visitor. Most beginners will start out as affiliates for smaller products where it’s harder to stand out from the crowd. However, as you begin promoting higher-end products, opportunities to add value with special bonuses that you can create (e.g. e-books, DVDs, special training sessions, etc.) will become increasingly important and necessary. At some point, you may even consider creating your own digital information products, such as selling your own e-books online. Good quality content marketing is the foundation of successful affiliate marketing businesses because it highlights your personality and knowledge of the chosen niche. Plus, it insulates you from accusations of crass, “hard” selling. Be honest. Reputation is critical to long-term affiliate success, so avoid excessive hype and exaggeration. Only promote products and services that will truly help your audience. Ensure that your content adds value to your audience, instead of wasting their time. Don't be afraid to spend more detail explaining product features and benefits and any personal reasons you recommend a product. Good copywriting is especially important as an affiliate. Affiliate marketing is a great way to make money on the internet. 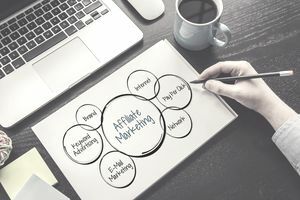 While some people focus on affiliate marketing exclusively, others use affiliate marketing as just one of many ways to generate income on the internet.